SiteHost Review 2019: Is SiteHost a Good Hosting? SiteHost is known for their flexible VPS and powerful dedicated servers. With two colocation facilities in Sydney and Auckland, the company serves thousands of businesses, designers, and web developers around the world. 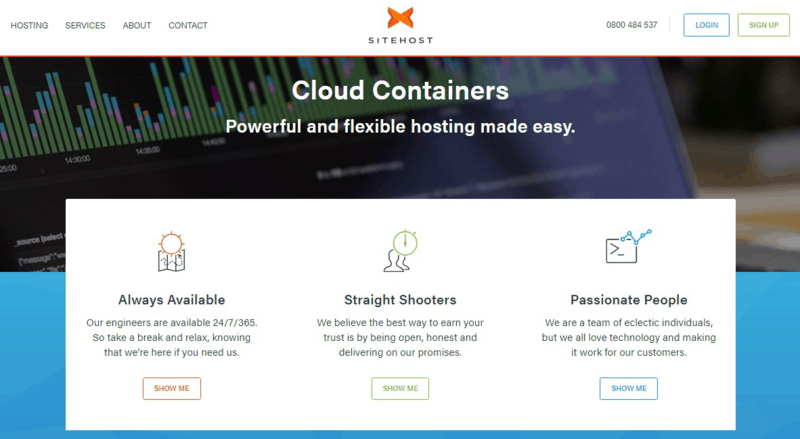 SiteHost is an Auckland-based hosting company that offers Linux and Windows VPS in addition to physical servers and cloud storage solutions. With few hardware problems and top-level support for customers, SiteHost delivers a service that’s second to none. With their VPS, cloud hosting, and dedicated servers, SiteHost serves mid- to large-sized organizations with unparalleled reliability and continually-improving operational efficiency. Note that since they’re a premium hosting provider, they’re not for beginners. You’ll likely need a degree of technical knowledge to effectively handle their solutions, although they do have managed hosting plans to take the headache out of these enterprise-grade hosting solutions as well. Their VPS hosting option affords users a nice upgrade from shared hosting: you can choose either managed or unmanaged hosting plans and customize your VPS packages however you wish. SiteHost will deliver a server with full root access, guaranteed resources, and no downtime issues at all. Upon making payment, your servers are instantly provisioned and can be up and running within minutes. If you outgrow your VPS, I highly recommend that you switch to their virtual dedicated servers. These mesh aspects of their virtual and physical dedicated servers for a happy medium, both performance-wise and price-wise. Slightly larger than bare metal servers, they come with dedicated SSD or HDD drives and powerful CPU cores. Their servers aren’t just secure but also offer more privacy and dedicated processing power. With this option, you get a machine that’s built for speed but at the price of a virtual server. What I like about SiteHost is that they give you a simple and user-friendly control panel to manage your websites, databases, and storage drives. You can run Apache and Nginx on different drives, schedule daily automatic backups, view resource usage and performance metrics, and even transfer your files via SFTP. Though not cheap, SiteHost gives you extremely reliable VPS hosting and bare metal dedicated servers at reasonable prices. Their servers are powerful and easy to configure. Note that there’ll be a separate GST charged, so you’ll need to factor that into your final costs. Support is another area in which SiteHost excels. They’ve got phone numbers listed for both New Zealand and Australia, along with real-time server status updates and an enquiry form through which you can email them. It’s rare that you’ll need to contact them since they’re proactive about maintaining their servers and facilities, but in the off chance you have to, they’ve got a proven track record of responding to support tickets in under an hour. SiteHost provides their customers with solid, hassle-free premium hosting and bespoke server solutions with excellent uptime and fantastic one-on-one support, all at a great price. Wondering how SiteHost stacks up against other Web Hosting companies? Enter any other Web Hosting company and we will give you a side-by-side comparison.